Bus tours aren’t for everyone. It seems like bus travel always comes with a few baked-in inconveniences. You always have somewhere else to be. You never have time to stop and enjoy a place (because there’s always a bus to catch). And the stops are almost always tourist hotspots. That’s why I found myself on the fence when I heard about Peru Hop, a Peru bus tour line. Still, a fellow blogger friend and I decided to give the service a try. In the end, we were pleasantly surprised with the trip. Unlike more traditional bus tour companies, Peru Hop caters to travelers who value flexibility. When you buy a Peru Hop ticket, you actually buy a year-long pass. You can use that pass to ride any Peru Hop bus along your route. Unlike most bus tour companies, you don’t have to stick to a set itinerary. If you enjoy a particular city or stop along the way, you can make arrangements to stay there for as long as you want. And you get all this flexibility at a fraction of the price you would pay for a traditional country-wide bus tour. 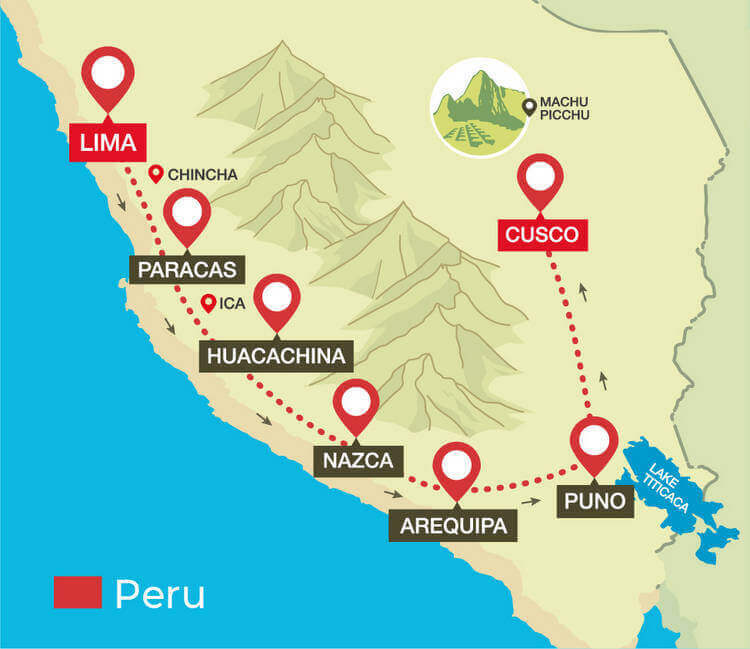 The route we took (which Peru Hop has named “Full South to Cusco”), one of the longest the company offers, costs just $199. Our route Peru bus took us from the capital city, Lima, down the Pacific coast before heading in-land to Arequipa and then up to Cusco (and Machu Picchu). This path allowed us to experience some of Peru’s most stunning natural and cultural attractions. 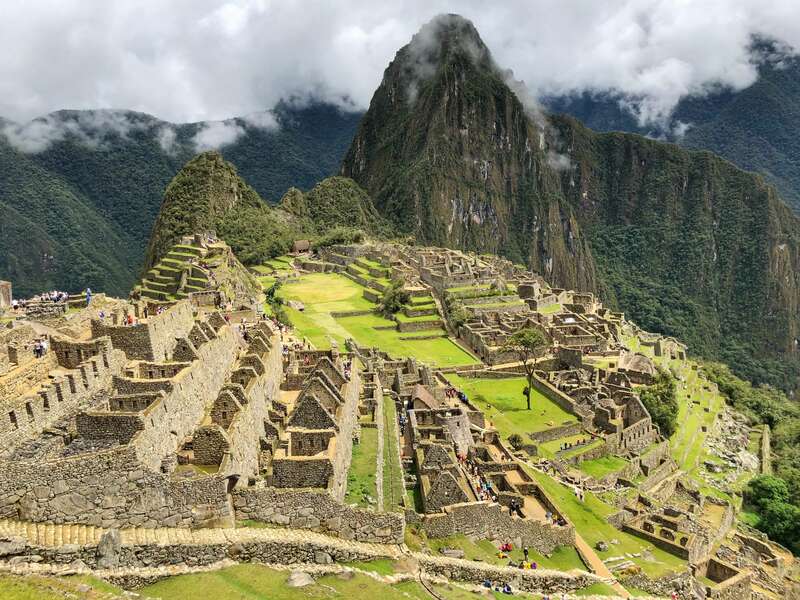 Many international travelers visiting Peru catch a flight straight from Lima to Cusco to get to Machu Picchu, one of Peru’s (and the world’s) most famous archaeological complexes. But flyers miss out on some of the coolest things Peru has to offer other than Machu Picchu, including Arequipa, Paracas National Park, and Huacachina. Peru Hop can take you to all these places and more. To help you decide whether this bus company is a good fit for you, I’ve written this guide to the best stops along Peru Hop’s “Full South to Cusco” route. Most flights into Peru land in Lima. This coastal city is worth a post all its own. It’s got some great seafood and is one of the epicenters of Peru’s world-famous cuisine. Though the city is cloudy for a good portion of the year, it’s nonetheless colorful, warm, and welcoming. Most people suggest that you stay in Miraflores but I much preferred the Barranco neighborhood. The neighborhood has a great energy, there’s so much to see and do and some of the best restaurants in Lima are found in the area. Check out this guide detailing not only what to do in Lima, but the best things to do in all of Peru. The first leg of this Peru Hop route travels from Lima to Paracas. But pass holders can choose between two buses for this part of the trip. 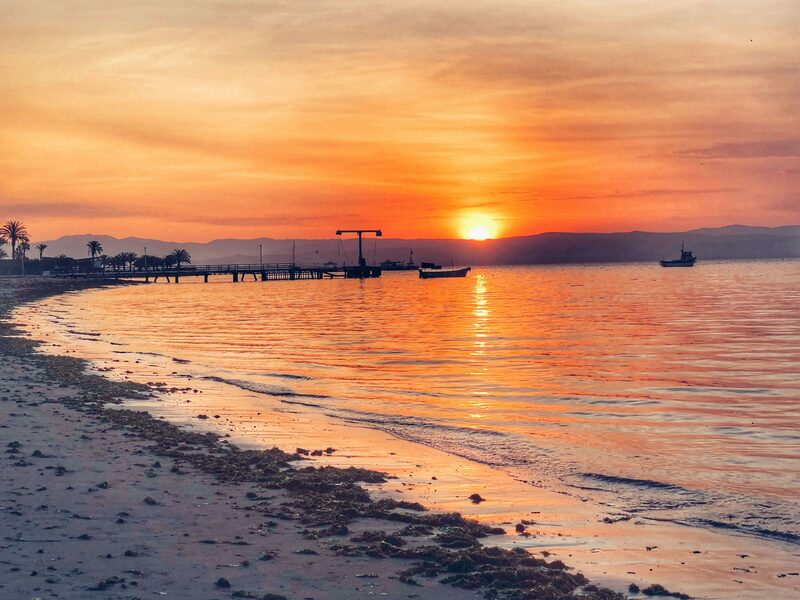 The first, the express route, takes you straight to Paracas without any stops along the way. The second, which the company has titled the cultural route, stops at several places along the way. 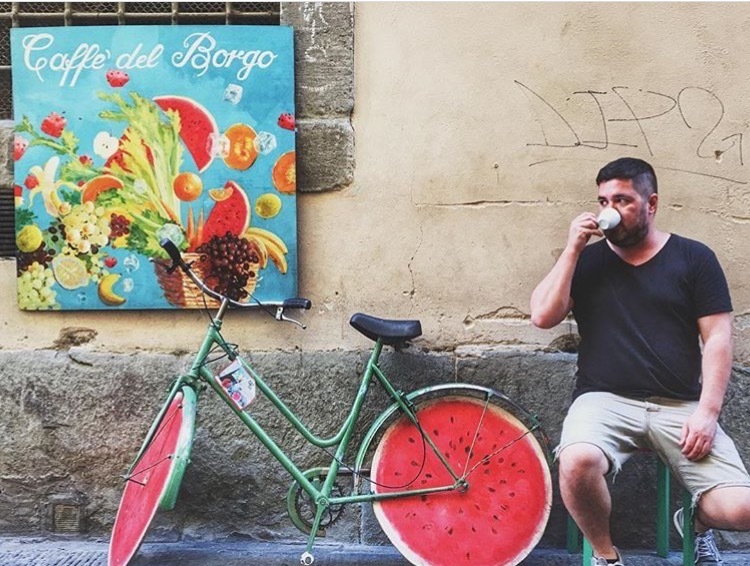 The cultural route costs nothing extra, so those with flexible schedules should take the time to check these smaller sites out. The first optional stop is Pachacamac. This archaeological site predates the Inca be a couple millenia. Because of its location, it’s been nicknamed the “Machu Picchu of Lima”. You’ll get some great views of the site, and Peru Hop even provides an on-bus guide. After Pachacamac, the bus stops briefly at a local bakery. This is a good chance to experience Peruvian food outside of Lima. 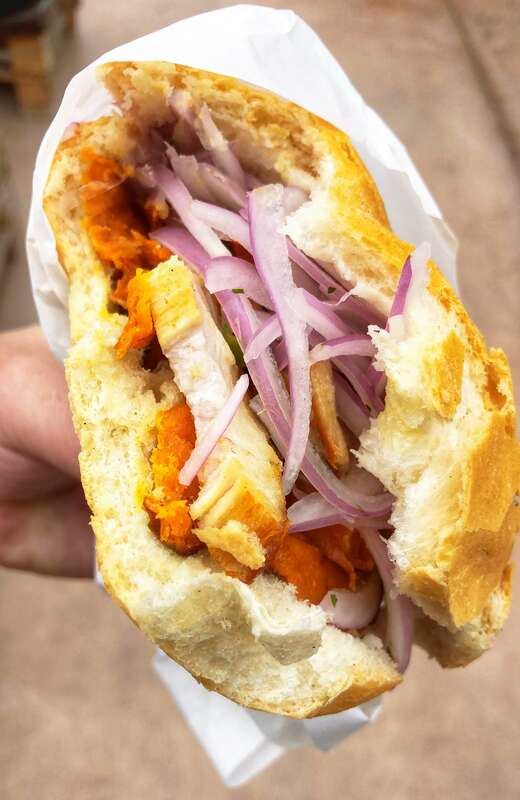 I highly recommend you try the pan con chicharron, maybe the most famous sandwich in the country and one of my favorite Peruvian dishes. The last cultural stop on the way to Paracas is the slave tunnels of Hacienda San Jose. In the 1600s, the people who built these tunnels used them to smuggle slaves to and from ships docking along the coast. But unfortunately, the slaves who used these hidden passageways weren’t being led to freedom, but instead to lives of captivity. Slave owners actually constructed the tunnels themselves so they could smuggle new slaves to their haciendas without having to pay taxes. 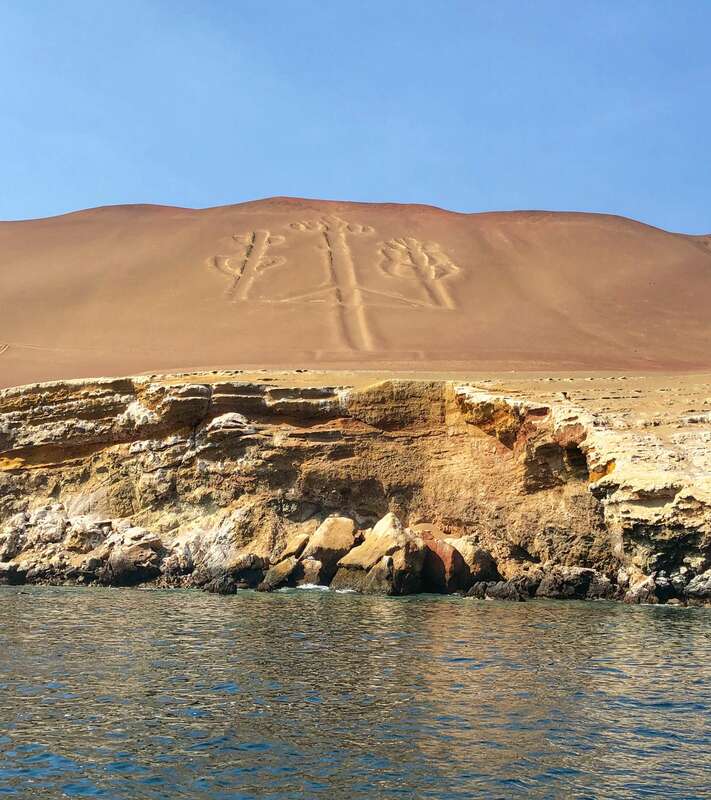 Most who visit the beach town of Paracas go to visit the national reserve of the same name. 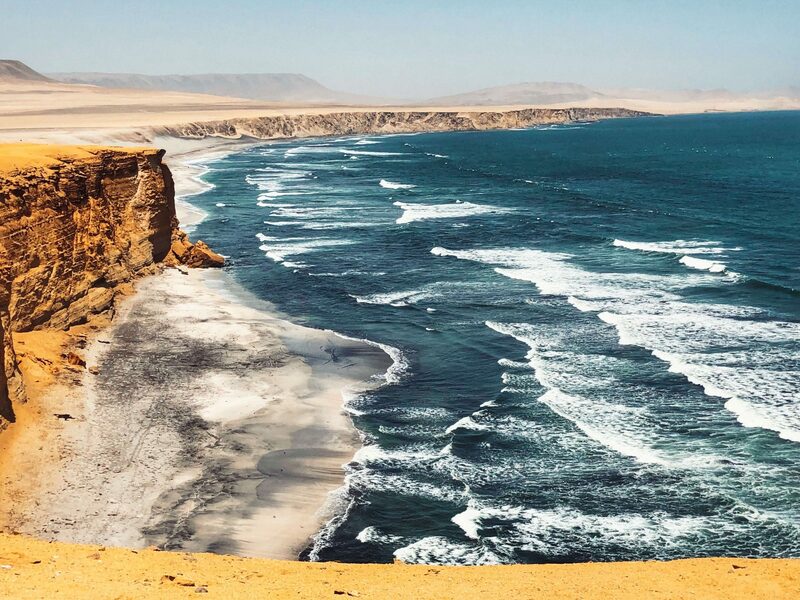 Paracas National Reserve, which stretches across the Paracas peninsula and south down the Pacific coast, features one of the driest coastlines on earth. The soil’s myriad of bright colors offered some incredible views and photo opportunities. Barren cliffs rise from the ocean, and the stark desert-like landscape stretches miles inland. 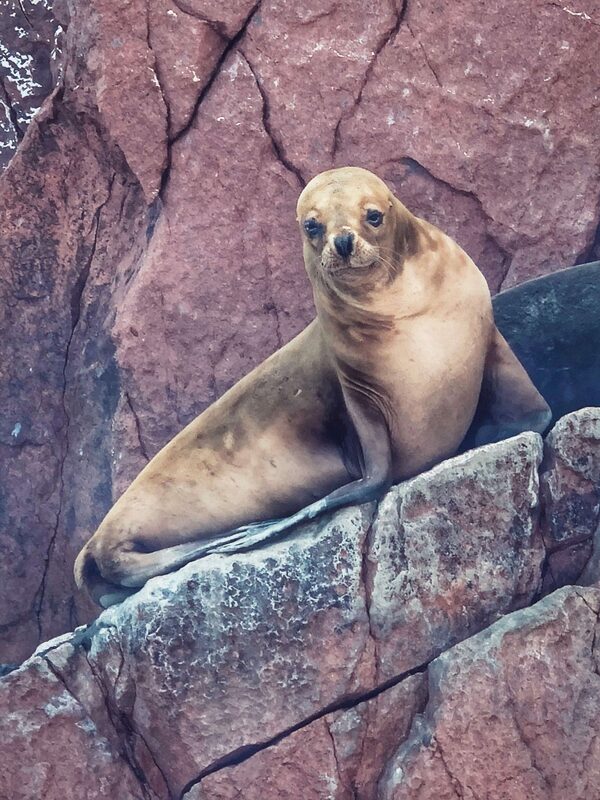 While visiting Paracas, you can also hire a boat out to visit the Ballestas Islands. This group of three islands jut out from the ocean about 10 miles offshore. Explorers can observe penguins, get up close and personal with seals, and maybe even glimpse a dolphin pod swimming off-shore. But make sure to return from the islands in time to catch the beautiful sunset over the mountains. 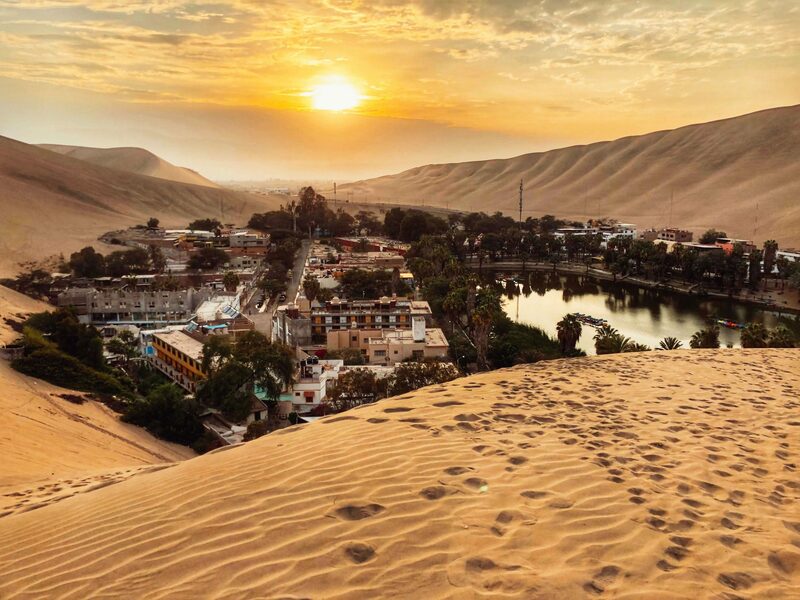 After Paracas, you can hop on the daily 1 pm Peru Hop bus to the next destination on the route: Huacachina. 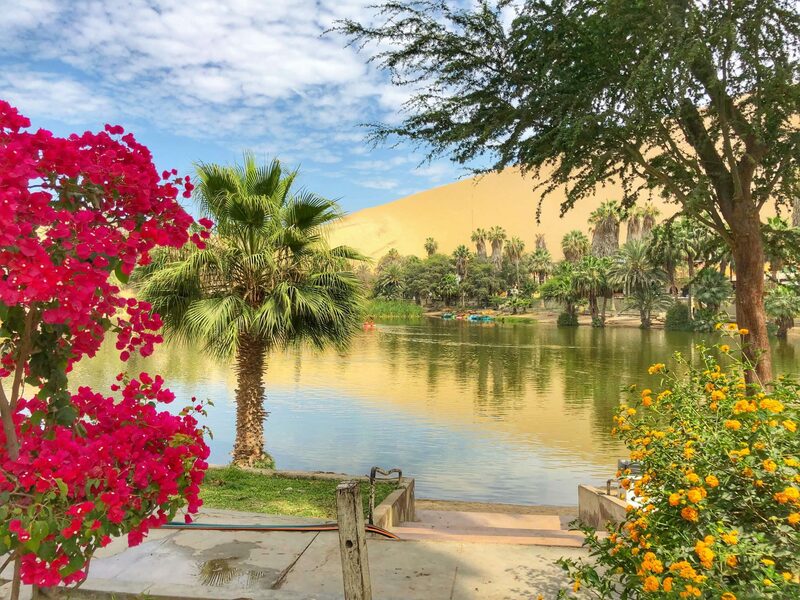 Huacachina is a desert paradise—a literal oasis flanked on all sides by towering desert sand dunes. The town is constructed around the only water source for miles, a small lagoon whose depleted waters have been replenished through the efforts of local business owners. This is the last place on earth you’d expect to see a snowboard or pair of skis, but surprisingly, both are quite common sites in Huacachina. That’s because sandboarding down the steep desert dunes has become one of the most popular things to do for visitors to the oasis. You can even take lessons from a professional before trying it yourself. Those who don’t want to give sand-sports a try can enjoy the desert landscape in other ways. Locals give dune buggy rides. If you want, you can even arrange to spend a night camping out in the desert under the stars. The crisp and dry air here make it one of the coolest spots in the country to stargaze. After a day or two exploring the desert at Huacachina, you can hop a bus to Nazca, the next stop on this Lima to Cusco bus route. Peru Hop doesn’t actually recommend travelers spend more than few hours in Nazca, as it’s really just a small village. People stop to see one thing. 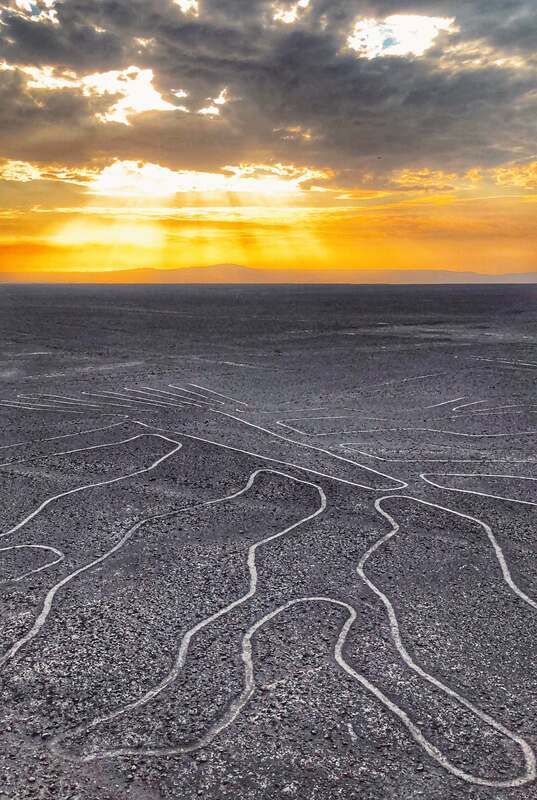 The Nazca lines are a collection of shapes laid out across the ground some 2500 years ago. The indigenous peoples who lived in the area at the time crafted the lines by arranging white stones against the dark earth. The designs stretch over thousands of feet. Depictions include a spider, hawk, monkey, and more. You have to get up pretty high to truly appreciate these monumental drawings. Luckily, you can climb a 43-foot tall tower to take them in. Peru Hop includes tower admission in their ticket price. If you’d like, you can also catch a plane for a flying tour. This option gives you the opportunity to see the more remote formations. Peru Hop recommends several flying tour companies. Prices range from 80 to 100 USD. After an afternoon at Nazca, the Peru Hop bus embarks on an overnight ride to Arequipa. A quick side note: though it may not look too big on a map next to Brazil or Chile, Peru is huge. For this reason, traveling the country by bus might not be ideal, especially if you plan to go further inland. The overnight bus to Arequipa is one of two on this Peru Hop route. Those overnights are definitely something to consider before purchasing a pass. Still, we found the mountain metropolis of Arequipa well worth the trip. 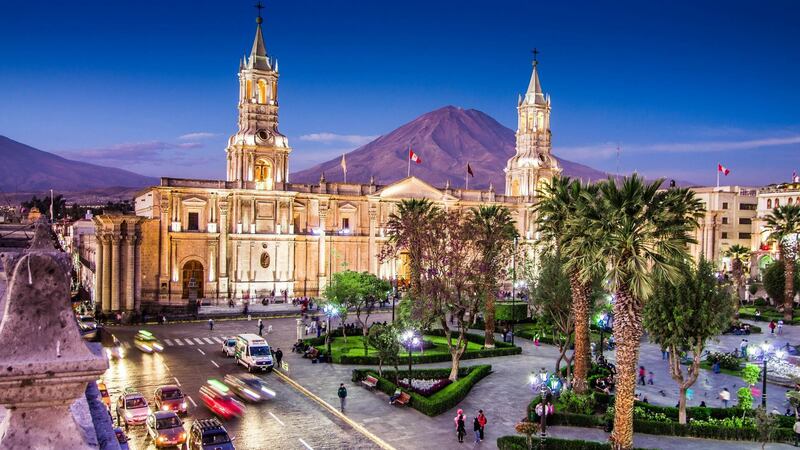 Arequipa is one of Peru’s largest cities (coming in second after the capital Lima). It’s a gorgeous town that’s full of charm and character. From the town’s historic center, you’ll be captivated by the Spanish colonial architecture built from white volcanic stone that shimmers in the sunlight. Even better, the entire city is back-dropped by the imposing, Misti Mountain (which is actually a volcano). Arequipa is unlike anywhere else on earth, and it’s definitely worth spending an extra day or two there if your schedule allows. In fact, because of the cool vibe and friendly locals, we extended our time in Arequipa. Many visitors also opt to venture 100 miles outside the city to Colca Canyon. This canyon, one of the deepest in the world, is home to several ancestral peoples. Many still practice the same agricultural traditions their ancestors perfected before the Inca rose to power. Though Arequipa ended up one of our favorite places in Peru, we weren’t too crazy about enduring another overnight bus ride. So, instead of hoping another Peru Hop bus to Puno and Lake Titicaca (the next stop on the Full South to Lima route), we decided to board a cheap domestic flight and head straight to our final destination—Cusco. Nestled some 11,000 feet up within the Andes, Cusco is one of the highest cities in the world. Once the capital of the Incan Empire, the city remains a major population center. It hosts some great food, archaeological sites, architectural wonders, and captivating cultural museums. But for most travelers, the biggest draw of the city is Machu Picchu. This world-famous archaeological site was once thought to be the “lost” city of the Inca, all because the Spanish invaders never found its location high up in the mountains. More recent excavations have demonstrated the Inca never used Machu Picchu as city at all, but instead as a palatial mountain retreat for Incan royalty. Those wanting to visit can reach the site from Cusco by train, bus, or even a multi-day hike (following the same road network as the Incan couriers who ran messages between Cusco and the palace complex when the Inca were at their height). Though bus travel isn’t for everyone, a Peru Hop pass is a good way to see the parts of Peru many travelers miss out on (especially those who fly directly from Lima to Cusco). The company’s flexible hop-on, hop-off policy puts them ahead of the pack among travelers who like to linger in an area or place when it speaks to them. As we traveled with the company, we also found no real mold that Peru Hop pass holders fell within. We met plenty of younger solo-travelers. But about one third were older or retired travelers. 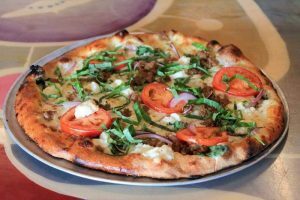 Overall, this form of traveler is best suited for the budget conscious traveler. Someone who’s okay with a little discomfort and wants to enjoy flexible transportation. We also found traveling Peru Hop to be a great way to meet new friends- I’m still in touch with a few of my fellow Peru Hoppers today, months after the trip. As it’s very safe and many activities are done in groups, I would also recommend solo female travelers concerned about safety to consider Peru Hop. NOTE: Peru Hop’s bus times, routes, and other details can change with the season and time of year. If you are planning to book a pass, make sure you consult the Peru Hop website carefully to double check the information you’ve read here. Disclaimer: I would like to thank Peru Hop for inviting me to travel as their guest. All opinions remain my own, as always.